Sensible Micro, a certified distributor of electronic components and supply chain partner to manufacturers across a variety of industries, is proud to announce its continued sponsorship at the 2019 Valspar Championship, an official PGA TOUR event. 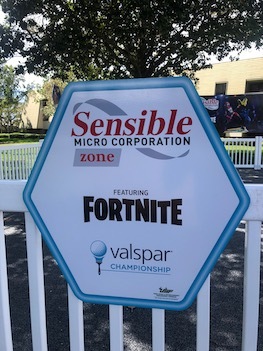 This year, Sensible Micro has also added a title sponsorship, the Sensible Micro Fortnite Zone. Attendees are welcome to join Sensible Micro on the Copperhead Course at the Innisbrook Resort in Palm Harbor, FL, March 18-24, where they can play the most popular online video game of 2018. The Sensible Micro Fortnite Zone will be located behind the 18th green and offers fans and gamers a unique Fortnite experience. The zone will feature a 30’ x 30’ gaming deck with a Fortnite-themed social media photo booth and 3-hole mini putt-putt area, including a watch-and-learn session from a professional on Saturday, March 23rd. “We are extremely excited to be an official corporate sponsor to the 2019 Valspar Championship. This event supports so many wonderful charities and has such a positive, lasting impact on the community, it's just great to be a part of", says President and Co-Founder, Chris Torrioni. The Valspar Championship is operated by the non-profit organization, Copperhead Charities Inc. The organization is run by a volunteer board of community leaders in the Tampa Bay area and has operated for 40 years under various tournament names. One of the greatest constants of the PGA Valspar tournament is its history of charitable donations. Since 1977 the tournament has donated over $41 million to various charities, with the 2018 Valspar Championship generating over $2.6 million for charity. The Valspar Championship Tournament kicks off Sunday, March 17th, with the Veterans Alternative Copperhead 5k, where fans can run or walk through the scenic Copperhead Course. Visit valsparchampionship.com for a full list of events and activities and other information about the PGA tournament.